This composite image shows a planetary nebula, Abell 30, located about 5,500 light years from Earth. 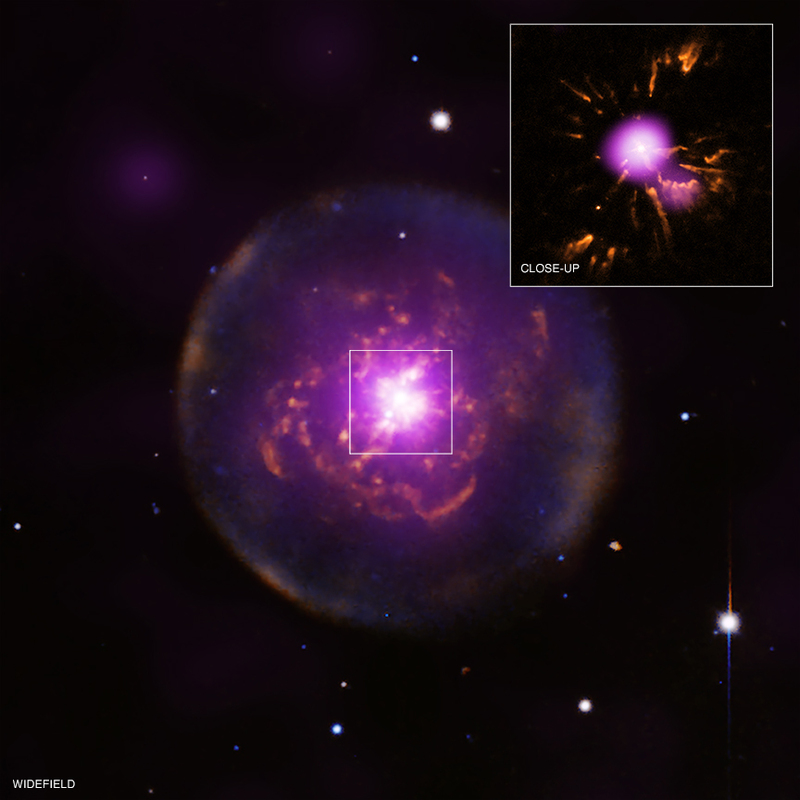 The large image and the inset show X-ray and optical data from Chandra, XMM-Newton, HST and KPNO. A planetary nebula is formed in the late stage of the evolution of a sun-like star. The evolution of A30 stalled and then started up again, so the planetary nebula was reborn, a special, rarely-seen phase of evolution. A planetary nebula — so called because it looks like a planet when viewed with a small telescope — is formed in the late stage of the evolution of a sun-like star. In rare cases, nuclear fusion reactions in the region surrounding the star's core heat the outer envelope of the star so much that it temporarily becomes a red giant again. The sequence of events — envelope ejection followed by a fast stellar wind — is repeated on a much faster scale than before, and a small-scale planetary nebula is created inside the original one. In a sense, the planetary nebula is reborn. The large nebula seen in the larger image has an observed age of about 12,500 years and was formed by the initial interaction of the fast and slow winds. The cloverleaf pattern of knots seen in both images, correspond to the recently ejected material. These knots were produced much more recently, as they have an observed age of about 850 years, based on observations of their expansion using HST. 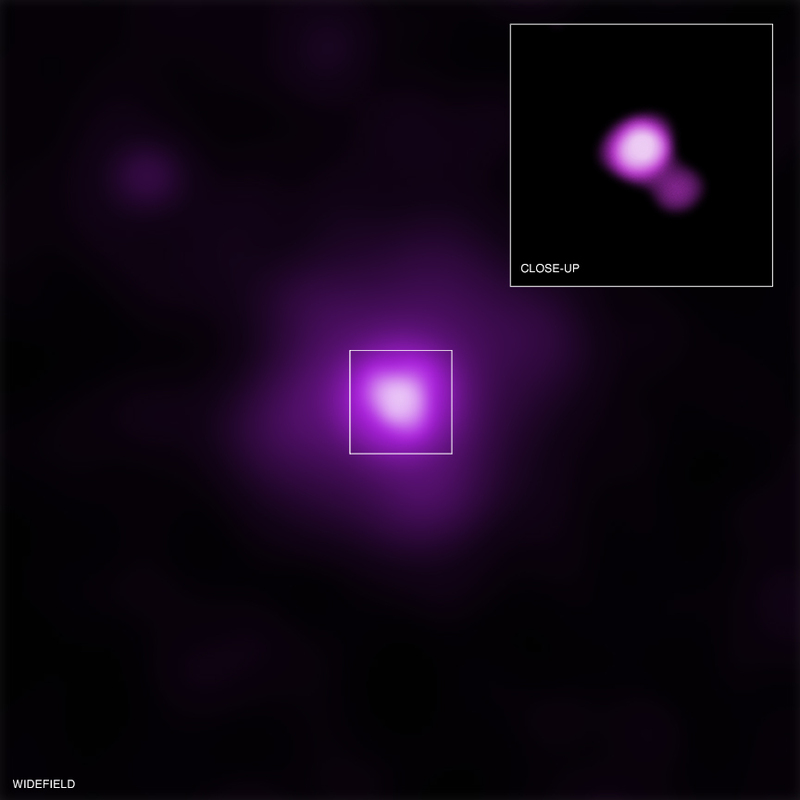 The diffuse X-ray emission seen in the larger image and in the region around the central source in the inset is caused by interactions between wind from the star and the knots of the ejected material. The knots are heated and eroded by this interaction, producing X-ray emission. 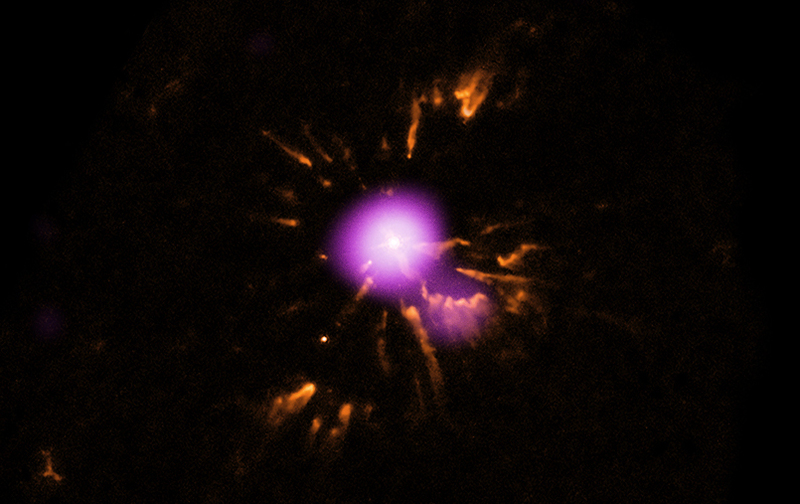 The cause of the point-like X-ray emission from the central star is unknown. Studies of A30 and other planetary nebulas help improve our understanding of the evolution of sun-like stars as they near the end of their lifetime. The X-ray emission reveals how the material lost by the stars at different evolutionary stages interact with each another. These observations of A30, located about 5,500 light years away, provide a picture of the harsh environment that the solar system will evolve towards in several billion years, when the sun's strong stellar wind and energetic radiation will blast those planets that survived the previous, red giant phase of stellar evolution. The structures seen in A30 originally inspired the idea of reborn planetary nebulas, and only three other examples of this phenomenon are known. A new study of A30, using the observatories mentioned above, has been reported by an international team of astronomers in the August 20th, 2012 issue of The Astrophysical Journal. The first author of the paper reporting these results is Martín A. Guerrero of the Instituto de Astrofísica de Andalucía (IAA-CSIC) in Spain. The other authors are N. Ruiz, also from the IAA-CSIC, Spain; W.-R. Hamann, from the University of Potsdam, Germany; Y.-H. Chu, from the University of Illinois, Urbana, IL; H. Todt, from the University of Potsdam, Germany; D. Schönberner, from the Leibniz-Institut Für Astrophysik in Potsdam, Germany; L. Oskinova, from the University of Potsdam, Germany; R. Gruendl, from the University of Illinois, Urbana, IL; M. Steffen, from the Leibniz-Institut Für Astrophysik in Potsdam, Germany; W. Blair, from Johns Hopkins University in Baltimore, MD and J. Toalá from the IAA-CSIC, Spain. Coordinates (J2000) RA 08h 46m 53.50s | Dec +17° 52´ 45.40"
Also helps you see the shear wonder of all existence. Good info for Science Olympiad. WOW. Great info on a great planetary nebula. A planetary nebula, formed in the late stage of the evolution of a sun-like star. About 5,500 light years from Earth. Combining data from Chandra, Hubble, Kitt Peak National Observatory and XMM-Newton. Inset is 1 light year across, Widefield is 5.6 light years across. In the constellation Cancer visible in the Northern and Southern Hemispheres.